My art and creativity blog with links to my paintings and photography. Bit, Bat, Bee: Rime with Me! Action rhymes, easy crafts, and lively activities teach the alphabet. Lively chants and coloring puzzles to help young children learn to count. Enjoyable puzzles and activities to reinforce phonics skills. Separate volumes for grades 1, 2, and 3. 110 seasonal art ideas using standard school supplies. A novel about dogs and friendship for girls ages 8-12. I just discovered that these great books are still available! I am not the "author", but I wrote most of the actual copy for Level D. It was one of my first projects, and I was honored to be part of the team. Click on the link and then, "Look Inside" to browse through the pages. Click to look inside this popular workbook, which introduces 5th and 6th grade students to many types of poems and to important poetic devices. A veteran classroom teacher and Language Development Resource Teacher, I am now a freelance writer specializing in supplementary eduational materials. I have also published fiction and poetry. In 2001 I wrote copy for Level D of SRA McGraw-Hill's "All-Star Word Studies" series. I also wrote the teacher's edition for that level. Next, I adapted twenty-eight licensed-character stories for "Disney's Parent and Child Read Together Series." These special early readers were later gathered into thematic anthologies. Since 2002 I have created dozens of classroom activity books and texts for games on assignment. Past clients include McGraw-Hill, Milliken, Frank Schaffer, and Instructional Fair. My most recent publishers include Edupress, Evan-Moor, School Specialty, Mark Twain Media, Linworth Learning, Highsmith, Learning Wrap-Ups, and Carson-Dellosa. 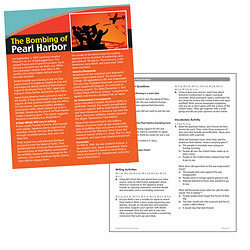 Engaging, full-color cards will open doors for exploring nonfiction text! Teachers guide offers tips on teaching text structures and explains how to use the cards individually, in small groups, and in whole-class instruction. Answer key included. 24 cards, 8" x 10"
Other subjects in this set include the British history and the English Language, potential vs kinetic Energy, Braille, tides of the Bay of Fundy, solar vs lunar eclipses, the Red and Black lands of Egypt, Pasteurization, Salk, penicillin, El Nino, Mesopotamia, Yellowstone's wolves, alpine vs desert biomes, galaxies vs nebulas, Meteor Crater, the Grand Canyon, grizzly bears, igneous rocks, the redwoods, code talkers, Mark Twain, Mendel's peas, and Mount Rushmore. 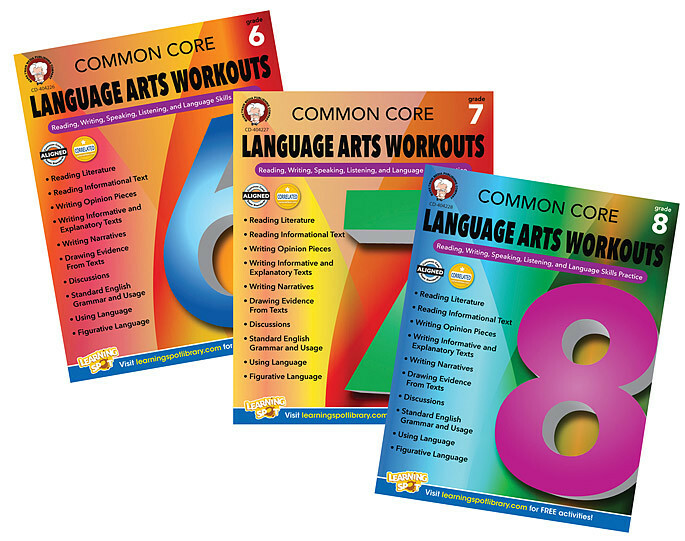 Reinforce critical reading skills with a diverse range of classroom activities! 48 pp., 8-1/2" x 11"
Centered around Common Core State Standards, Common Core: Complex Issues in Text is designed to help students read both fiction and nonfiction with a critical eye, develop reasoned opinions, and defend ideas with specific examples. 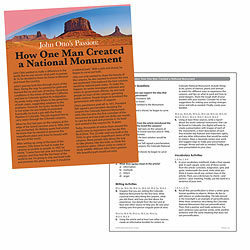 Practice pages, student charts, graphic organizers, research challenges, discussion starters, writing prompts, games, group activities, and recommended reading lists enable students to practice: uncovering the author’s purpose; spotting propaganda and bias in nonfiction; sorting credible from unreliable narrators in fiction; seeing one event from multiple points of view; building arguments for informal debates; and using inference and connotation to discover underlying meanings. This book is filled with fascinating stories, from the night a shy young woman's play changed Broadway to the day the most successful talk show host in history got her start. Find out about the stage actor who once earned letters in four college sports--and who won academic honors, too. Follow the triumphs and disappointments of some of the most famous black entertainers in our nation's history. Rediscover great personalities who have been forgotten. And learn about how the roles of black performers both changed with and helped changed American society. Illustrate social studies units with photographs and illustrations of influential Black Americans or spark research and writing activities with important black history events. Two different sets. 24 cards each. Three Easy-Read Biographies from Hameray! The Hameray Biography Series is specifically written to meet the needs of reluctant readers in grades 3-8 while matching social studies curriculum. The books are written for students reading at least two levels below their grade. The interest level is for all readers, thanks to the collection's fascinating and relevant content. Providing highly inspirational stories of courageous individuals, the series highlights the lives of people from different cultures, backgrounds and time periods. Henry Ford made America's most popular automobile for its time. As a businessman, he changed the face of American industry. By introducing assembly lines and paying his workers fair wages, Henry Ford changed how America worked, and how they got to work! But his greatest achievement was building a car almost everyone could own. Starting with his Model T, he really helped put the world on wheels. Dr. Jane Goodall is one of the world's most famous scientists, having studied chimpanzees in Africa for over 50 years. Her discoveries have transformed the way we think about these fascinating creatures. Throughout the course of her life, she has tirelessly worked to raise awareness about wild animals in Africa, and the people who are trying to save them. Read about her heartwarming work, and how she has become a hero to millions of animal-lovers around the world. The most famous woman pilot in history, Amelia Earhart is known as much for her mysterious disappearance than her flight career. She was the first woman to fly non-stop across the Atlantic and Pacific Oceans, by herself. But it was Amelia's last flight that gets the most attention. She completed most of her flight around the world before her plane disappeared. What happened to Amelia Earhart?